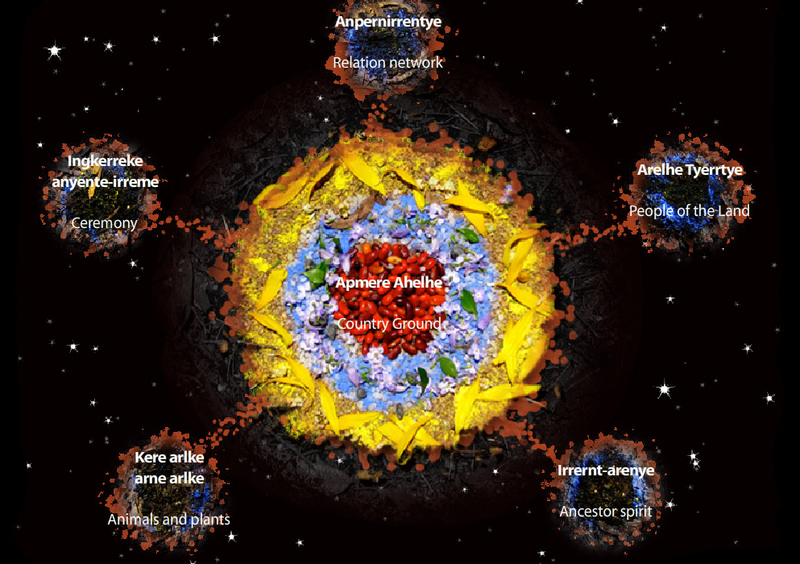 Aboriginal spirituality derives from a philosophy that establishes the holistic interconnectedness of all the elements of the earth. The land is honoured as sacred and intimidate connections between human beings and nature is celebrated. 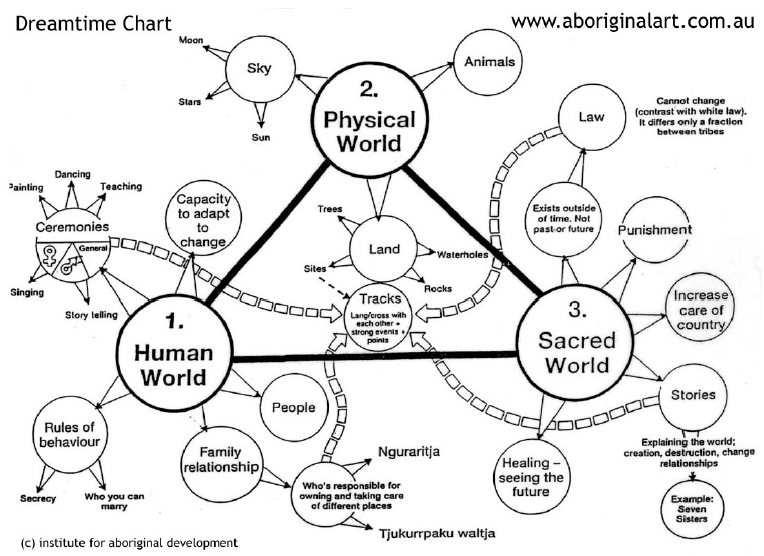 Aboriginal Spirituality is so incredibly diverse. Over 230 Aboriginal languages have been counted, with further dialects existing within these languages. Each have their own culture, spirituality and creation stories. 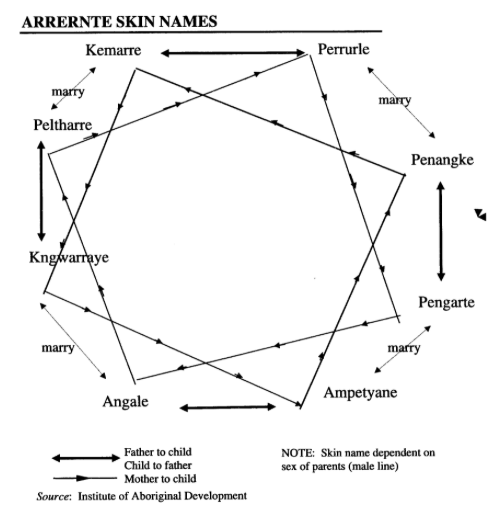 For the purposes of explanation, Arrernte spirituality will be used. Due to the rich diversity, it is impossible to state a particular set of beliefs that apply to all Aboriginal language groups. However the following quote accurately summarises some of the more central understandings of Aboriginal Spirituality. We don't own the land, the land owns us. The land is my mother, my mother is the land. Land is the starting point to where it all began. It's like picking up a piece of dirt and saying this is where I started and this is where I'll go. The land is our food, our culture, our spirit and identity. Each Aboriginal person identifies with specific Dreamtime stories which indicates a state in which or during which contact is made with the ancestral spirits, or the Law, or that special period of beginning. Thus, the dreaming gives Aboriginal people an identity and dictates how they express their spirituality. Within these sacred stories are also embedded the laws governing the relationships between the land, people and spirits. Legends of the 'Dreamtime' are handed down by word of mouth and by totem from generation to generation. Songs, stories, rituals, places and symbols bring life to the power of dreaming. The Arrernte people of Central Australia refer to the 'Dreamtime' as altjeringa, alcheringa, alchera, or aldjerinya - “springing from eternity”. However each language groups have their own names: tkurkurrpa, palaneri, bugaregara, ungud, wongar, bugari etc. Each language group will have multiple 'dreamings' however the story of the Rainbow Serpent is perhaps the oldest continuing religious belief in the world, dating back several thousands of years. 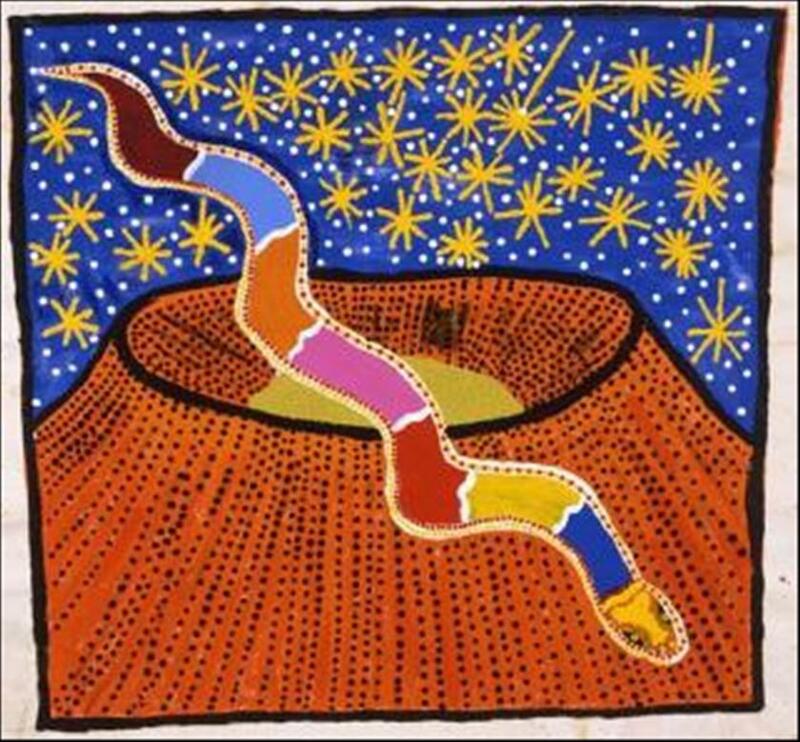 The Rainbow Serpent features in the Dreametime stories of many mainland Aboriginal nations and is always associated with watercourses, such as billabongs, rivers, creeks and lagoons. The Rainbow Serpent is the protector of the land, its people, and the source of all life. However, the Rainbow Serpent can also be a destructive force if it is not properly respected. Dreaming stories in Central Australia link the Rainbow Serpent to impact craters caused by meteors. They represent the spot where the Rainbow Serpent crashed to the Earth. Arrernte people believe in the Caterpillar Dreaming - "We're caterpillar Dreaming. That Dreaming, it's been there all the time, its through Creation. We follow what our old people told us - that dreaming was given to them in the beginning of time" ~ Rosie Furber. 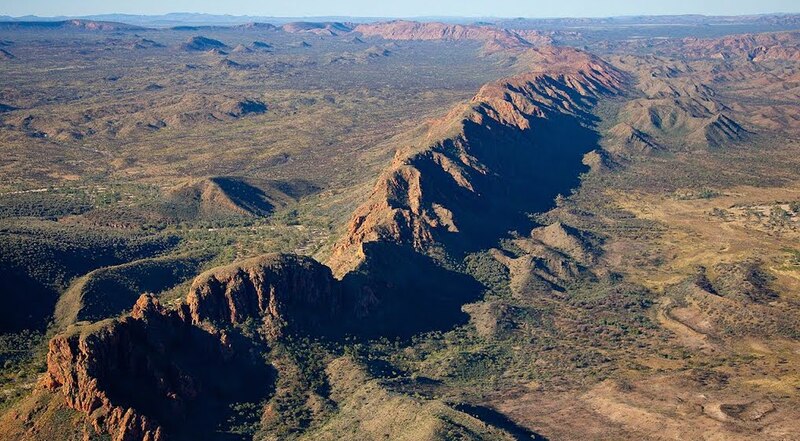 This dreamtime story explains how the MacDonnell Ranges were created. The MacDonnell Ranges were created by great mounds of carcasses of caterpillars of the Hawk Moth - the Ayepe-arenye (tar-vine caterpillar), Utnerrengatye (emu bush caterpillar) and Ntyarlke (elephant caterpillar) - when they lost a great battle with their enemies, the stink bugs. The caterpillars came from different places known today as Central Mount Stuart in the north, Finke in the south, Atula in the east and Mt Zeil in the west. The city of Alice Springs (Mpwarntwe) on the Todd River is central to the Yeperene Dreaming story, and gaps in the range are said to have been formed when the heads of caterpillars were bitten off by the stink bugs. This work is an Aboriginal mapping of Alice Springs with the caterpillar on the left representing the East Mac Donnell ranges and to the right the West MacDonnell Ranges. Flowing through the Gap, is the Todd river and the concentric circle in the middle refers to an important secret site where initiation ceremonies were performed. Emily Gap (Anthwerrke) (above) in the East MacDonnel Ranges (below) - scared sites for the Caterpillar Dreaming. Printed texts are not a component of Aboriginal Spirituality. Nevertheless, there are other sacred methods to convey the essential stories, teachings and traditions from generation to generation. Oral stories: Passed from generation to generation, they record the travels and activities of Dreaming Ancestors. They are closely related to the land and recall the ways in which the actions of the Ancestor Beings shaped the environment as it is now known. As the living people moved over the same land, knowing these stories gave them the knowledge of the waterholes and food now which their lives depended. While most of the Aboriginal stories tell of figures associated with specific clans or family groups, there are stories of Spirit Beings whose powers and influences transcended these limits. Rock Art at sacred sites: an expression of belief and the sacred representation of the creation and workings of the universe. Rock paintings thousands of years old are believed to have been left by Ancestor Beings. Painting can connect Aboriginal artists with the Dreaming. Aside from the Aboriginal Flag, rock art and dot paintings, there are no such 'symbols' of Aboriginal Spirituality. However the adjacent image illustrates some of the symbols used in paintings by people of the Central Desert region - a region in close proximity of the lands of the Arrernte people. These symbols typically symbolise elements of the dreamtime, often associated with particular clans or totemic groups. Aboriginal people actively perform a large number of rituals to preserve culture and spirituality. These occasions unite communities who often gather at sacred sites to celebrate and perpetuate Dreaming events. These rituals include but are not limited to: initiation ceremonies, burials, welcome to country, smoking ceremonies etc. Many of these rituals are characterised into 'Men's Business' or Women's Business', with their respective rituals remaining secret from the other. Aboriginal rites of passage are ceremonies that inform the individual and society of the new status amongst the group. 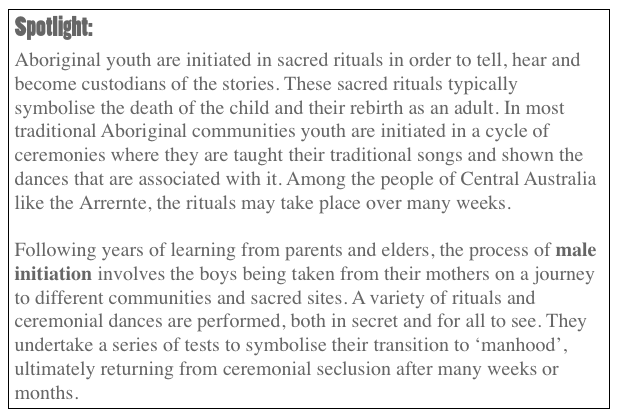 These rites include the initiations of the tribes men and funerals of the elders. Smoking ceremonies are used to remove evil spirits or heal an individual, and are generally conducted by a female elder in the community. 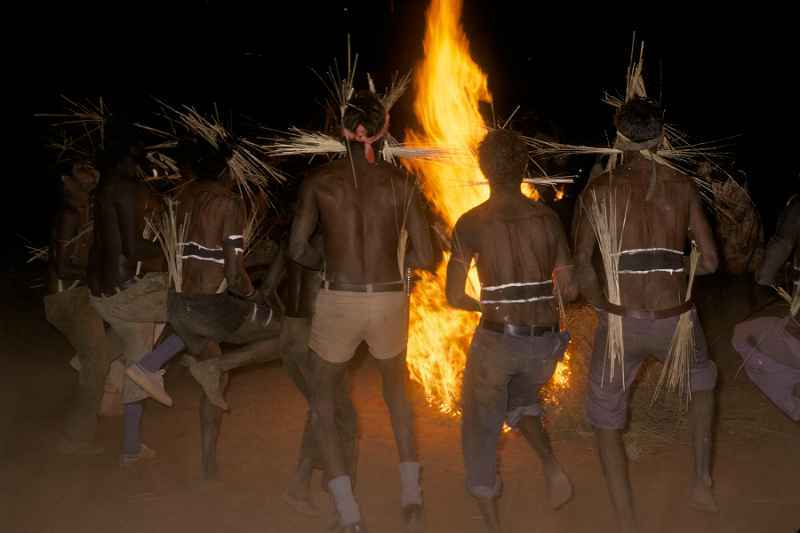 These rituals are performed regularly and are immensely sacred to the Arrernte people. "This type of ceremony has been around since time began and was used by our ancestors. The plant is a bush medicine and is used on many different occasions and helps cleanse your mind and heart and gives you strength and power as a person,"
Aboriginal society is a complex and sophisticated network of relationships, rights and obligations. Everyone is related and all relationships are respected. Kinship is the fabric of society, a complex system that determines how people relate to each other and their roles, responsibilities and obligations in relation to one another, ceremonial business and land. The kinship system determines who marries who, ceremonial relationships, funeral roles and behaviour patterns with other kin. Aboriginal people are born into the responsibility to care for their country - 'ampere'. With this comes the responsibility to pass on their Ancestor's stories, culture and traditions. The timeless cycle of mutual dependence can only continue when the land and all forms of life it contains are preserved. They also have obligations to family. 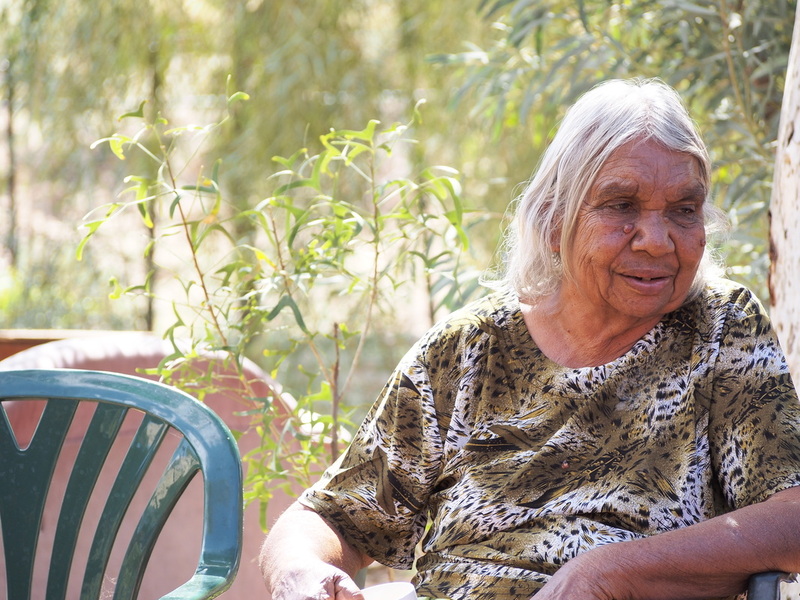 Arrernte culture has survived for tens of thousands of years on what is known as a 'communal rights' system; this is a fundamental component of Arrernte culture and in that sense, spirituality. 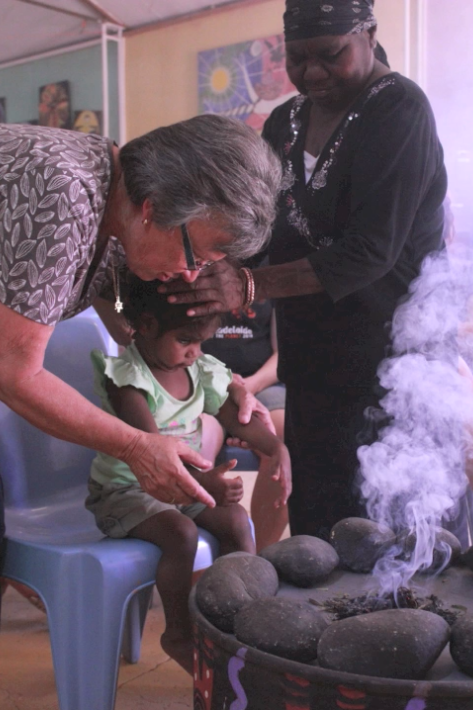 Living on country is perhaps the most fundamental spiritual experience for Aboriginal people. In this environment, ceremonies and rituals can be practiced, dreamtime stories can be shared and sacred sites can be visited. In particular, it is through the performance of ceremonies and story telling that contact is made with the ancestral spirits. To understand out law, our culture and our relationship to the physical and spiritual world, you must begin with the land. Everything about Aboriginal society is inextricably woven with, and connected to, the land. Culture is the land, the land and spirituality of Aboriginal people, our cultural beliefs or reason for existence is the land. You take that away and you take away our reason for existence. We have grown the land up. We are dancing, singing and painting for the land. We are celebrating the land. Removed from our lands, we are literally removed from ourselves. Traditionally, society is governed by a system of Elders. There are male Elders for men’s business and female elders for women’s business. They have a dominating presence in Aboriginal communities and an essential role in other rituals and ceremonies, particularly during the process of initiating people into aspects of religion and spirituality. The gaining of power by the acquiring of traditional and ceremonial knowledge is an experience only reserved for the initiated whose personality and character satisfy their traditional elders.